New images found during a datamine of the latest Paladins update appear to provide even more evidence that the game will one day make it to the Switch. The game, a free-to-play hero-shooter that has often been described as an Overwatch-clone, has already been the subject of Switch-based rumours in the past, with various mentions of an "Oasis" codename hinting at future Nintendo support. While the word "Oasis" is used in English-language coding, other languages appear to translate this name to the much more obvious phrase of "Nintendo account", suggesting that "Oasis" was put in place to cover up any mention of the Switch. Now, Reddit user Marxally has discovered the following images during a datamine of the game's latest update, clearly hinting that Joy-Con controllers will feature some kind of support. Unlike the Pro Controller, which recently received support for use on Steam, the Joy-Con controllers are (at least officially) only compatible with the Switch. The thought here is that the images would appear in the game's menus alongside images of the PS4 and Xbox One controllers, where players can remap their button layouts. It certainly gives more hope of the game appearing on Switch, but we'll have to wait for an official confirmation before getting our hopes up too much. Do you play Paladins? Would you like to see it land on the Switch? Let us know in the comments below. I'd play Overwatch but would pass on an Overwatch clone. Because I used to play Overwatch and wouldn't mind getting back into it. But any clone would just make me want to play Overwatch. The only reason that I want Paladins on the Switch is that hopefully Blizzard will put Overwatch on the system. I still don't get why they haven't yet. Especially now that there are a lot of reasons to believe Fortnite is coming to the Switch. This is actually really good news. This on the Switch would finally show that games like Overwatch could run on the system, (Something that seemed self-explanatory but some failed to believe until getting actual proof) So while the game itself may not be that exciting, this could open the possibility of more multiplayer shooters on the Switch. They will Probably chuck in a few mario skins and charge 40 quid. Hope not. This game is free to play, and I really like it. I play it on Xbox One and I hope it will be released for Nintendo Switch too. Would really love Overwatch to come to the Switch, but will pass on these clones. Those dismissing this as an Overwatch clone should bear in mind that it's already a massively successful game in its own right on Steam, with Very Positive reviews. Boycotting anything except Overwatch is like ignoring any MMO for being a WOW clone. You know, I don't hate the idea of borrowing a game's concept and trying to do something unique with it. But when a company does a complete and obvious clone, I don't want to support them even if the game itself is fun. I don't know anything about Paladins. Does this have any sort of offline mode? If not I'm curious to see how it will do on Switch. I think that's the primary reason we will probably never see Overwatch, but maybe this can test the waters. Paladins can compete with Overwatch because 1. it's on Steam and Overwatch isn't and 2. it's free. If it comes to Switch then it has a better version of the first advantage, but who knows what the second one is. Not sure how happy devs are about putting F2P games on a Nintendo console, those pinball games notwithstanding. Saying Paladins is a Overwatch clone is like saying DKTF is a 2d Mario Clone... just because it's a platformer doesn't mean it's the same thing. @Rika_Yoshitake I don't think calling Paladins a clone is even appropriate in this case. The two games have a little too close of a development cycle to be making changes in such tiny timeframes for copying heroes. It takes quite a bit of time to make new models and animations. If anything they probably have the same inspirations. LoL, Dota 2, and Heroes have characters that have pretty similar abilities since they all have inspiration from the original Dota (with members of the original team having worked on all 3 of the spiritual successors). Not all of the characters are the same or similar between the 3 games and that's also the case with Overwatch and Paladins. First of all, Paladins is not a clone of OW. 2, you can't copy a game 21 days apart. Sure some characters have similarities, but that's about it. I have both, and actually enjoy Paladins more. Overwatch is better graphically, but Paladins has more characters and maps to choose from. I honestly thought they had shut this game down since it Overwatch has really hogged in on that territory. I’m sorry you were left in educated on the history of these team shooters, but I have to inform you that Paladins was both in development first and available to the public first - but that doesn’t mean they are a copy of each other. Let me know when we actually get Overwatch. This is as irrelevant as getting a Zelda clone on PS4. If anyone is putting down Paladins without having TRIED it first, then you really don't know what you are talking about. It is a game that is just as fun as Overwatch. Its not a clone, as it was in development before Overwatch was. It just happens to be another game in the same style as Overwatch. Its like saying "Fortnite is just a clone of PUBG, so I won't play it because its just a clone." If a game is good, I'll play it...and Paladins is a good game. Also, it will fill a nitch on Switch that no one else has bothered to want to do. I'm up for it! Paladins is actually a really good game in its own right, even though its debt to Overwatch in terms of design is pretty clear (yes, it started development first, but there were some major and obvious shifts along the way in reaction to what Blizzard was doing). But it's a fun game I'd happily load up and play on the Switch if it was available. I played for a little. I kinda liked it and wouldn't mind seeing it on the switch. And if made F2P, it would be pretty nice. but you already play a clone game. Overwatch is a blatant TF2 clone, and I wouldn't support such obvious scams like that. Just came to correct a little thing. Paladins was in dev long before the reveal (since 2010) and is very different in some aspects. As someone who has spent over 200 hours in both, I can tell you it's hard to go back to anything else than Paladins, notably because of the loadout customization. I can see the quality of publications hasn't increase here. I've been away from this site for a reason. Sad that I have been forced to come back here to correct you. Overwatch clone? What a disrespectful article, as a gaming journalist you are supposed to inform about games, not call them clones. Shameful. Would love to see a free to play game of this quality at the eShop regardless the fact of being a copy. right back at you, kiddo. go back to playing your sub-par clone game. Team Fortress and Overwatch are certainly in the same genre but have very distinct differences and flavor. Paladin's characters and gameplay is very very similar to Overwatch. Or perhaps Overwatch is similar to Paladin's. But I like Overwatch better either way. So tough luck, Paladin lost. to quote a certain fanbaby: "Nice trolling attempt." Either you're trolling or you never played Paladins, I played both and can say Paladins is different. Please show me Overwatch's Card system, or how you can change the characteristics and abilities of characters before and during the match? Two of the same characters in paladins can play completely differently based on what cards you have and abilities you purchase mid game. Paladins =/= Overwatch anyone who says otherwise is a casual. Calling Paladins a clone, is this a news post, a review or an editorial? Stick to the facts with some color. Calling a similar game a clone. That’s like calling Doom a Wolfenstein clone! I grew up on Spear of Destiny... Leave it to the comment board to call it a clone. As for the games. I played Overwatch first, so playing this game may make me miss Overwatch. Even if Paladins comes to Switch, It won’t convince Blizzard to bring OW. They even called out Sony at one of their Blizzcon’s for launching PS4 not long after D3 was released on PS3. Probably left a bad taste for dev’ing for console. Side note, check out the bench test for Overwatch on the Smach Z portable PC. They play it on low settings. I plan to watch a few times to get an idea of how it would work on Nintendo Switch. @Heavyarms55 then go ahead, because paladins was in development long before overwatch, overwatch released first because blizzard has a lot more people and money than hi-rez. Some die hard Paladins fans in this thread. Whatever floats your boat guys. Have at. I really don't care. I was always hoping that Overwatch would make it to Switch eventually, but if Paladins comes out that would be awesome too. One way or the other, I would love to play a team-based multiplayer first-person hero shooter with motion controls on the Switch. Except WoW was the copy cat game if anything... very far from the first MMORPG with classes like that, progression, and a fantasy world. heck, i played final fantasy 11 a ton and even it was out a few years before WoW and liked it more than WoW. heck, even before final fantasy 11 there was everquest. the reason people are calling it a clone is because it is basically an exact rip of overwatch... just cheapen overwatch by zooming way out overhead, reskin the characters, give all characters 3-4 ability sets that are the same for each class (just give the ability different color animations), and do everything else the same. people call it a clone because it is like playing mario odyssey then trying to go play mario run. it's less than overwatch in every way but copies it as much as possible. this is why people want overwatch, we don't want a lesser want to be game. i personally don't see overwatch making it to switch because i just don't think they could get it working right without making it look pretty poor... but idk. didn't paladins get shut down on xbox and ps4? i think the only version available is on mobile phones and it's that way because there is no overwatch on mobile phones... like i said it is a lesser game than overwatch, so it now lives in an ecosystem devoid of overwatch as competition. All of you saying Paladins is a clone, FYI paladins was in alpha before overwatch was, overwatch was just released first. Having put 100's of hours in both games, they are far more different than say CoD is different from Battlefield. @Heavyarms55 Hey, I just wanted to tell you to not get fooled by the title of this article. Paladins is not a clone of Overwatch. It would be like saying Overwatch is a clone of TF2, Forza is a clone of Need for Speed, Battlefield is a copy of CoD, etc. while they are not. They do share some similarities, of course, since they are in the same genre. 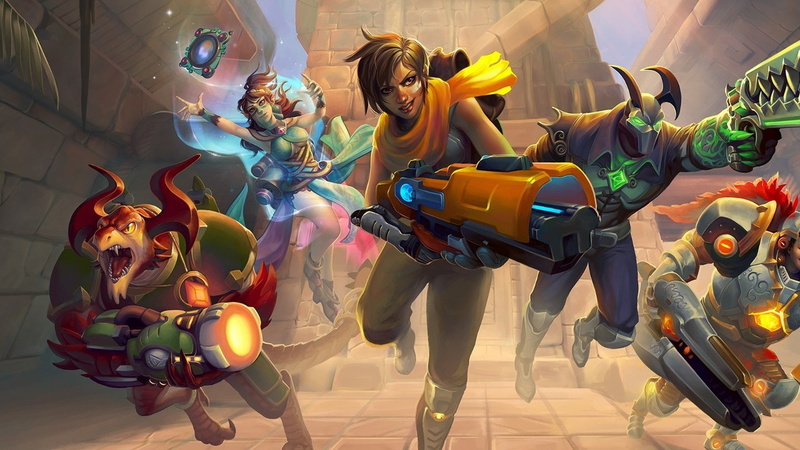 Paladins is a fantasy 1p and 3p shooter with some RPG/MOBA elements. There is customization which can be refreshing after playing Overwatch, the TTK is higher, there are MOBA gameplay elements team comps are different, etc. Of course, not everyone will like it since everyone has their own opinions. I say you should give it a try, after all, it's free. I am trying to be civil here, not having all those bs arguments. If you end up trying it, why not give me a quick 'Sup' DM with my same IGN? Take care. @RainbowStarMan Trust me, I get the idea now. Thank you for being civil about it, unlike 28 million others who weren't.